This article is intended for persons who have previously downloaded tax tables and now need updated tax formulas for the new year. Payroll tax tables include formulas for federal income tax, FICA – Social Security, FICA – Medicare, and state income tax tables. You must manually update FUTA & SUTA rates separately. You ordered new tax tables through the Procare Online Store. Or, your first time purchase of the Procare Payroll module was in the last quarter of the year (Oct., Nov., Dec.). 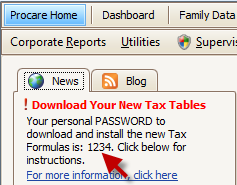 Once the new tax formulas are available, the password will appear on the Procare News tab (left side of the Procare Home screen). This will likely appear during the first week of January. The password below is just an example. From the Procare Home screen click Configuration > System. Go to Accounting Management > Payroll > dbl-click Payroll Formulas. 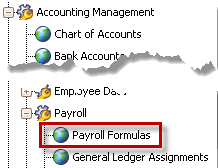 Click Download & Update at the Payroll Formulas screen (bottom center). 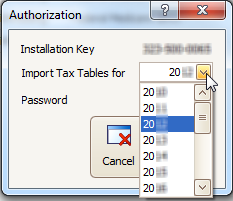 Choose a year for which you wish to Import Tax Tables, then click Continue. Enter your unique Password and click Continue. The password shown below is just an example. 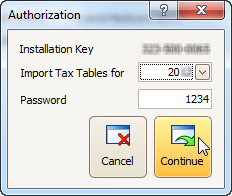 Confirm that you wish to install tax tables for the selected year. Your tax tables are now up-to-date. In some cases you may get a message saying: Online File Not Available or Unable to Download. This can happen if you are not online, or if the tax tables are not available on the Procare site. For example, tax tables for the new year are typically not available until early January. Generally you’ll answer “No” to the message. Searching local drives is only useful in very specific circumstances. Contact Support if you need further assistance. How do I download the latest tax tables? How do I order Tax Tables for the New Year? When are changes to tax tables available in Procare?